100 Creepy Little Creature Stories is one of the few short story collections that has been able to entice my long-fiction preferring brain; purchasing this little treasury back in 2006, feeling that really, I ought to try some short fiction, I’ve since been steadily, although slowly, returning to this book, even re-reading certain short stories and forcing friends, family, and once a graduate class, into reading one of the stories I discovered. While my usual fast reading style has me polishing off a novel a week, and I’ve been returning to and reading this book only a few times a year, each time I put it down in favor of a novel, the craving for more short bursts of horror fiction would call me back again until, amazingly, I had read and re-read five hundred plus pages of short stories. 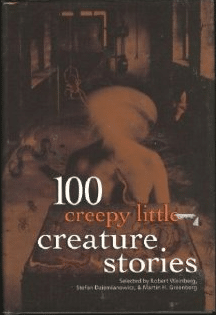 100 Creepy Little Creature Stories is part of the 100 Stories series which features everything from 100 Vicious Little Vampire Stories to 100 Malicious Little Mysteries, focusing on the short story form of about every fiction genre you could possibly ever want. Now considered an old series, the good news is that you can pick up many of these weighty little hardcovers for a few dollars each on Amazon, meaning that if you’re a collector like me, you can go on a huge spending spree. And yes, yes I did. This particular entry in the 100 Series features horror stories concentrating on creatures, from those familiar to our culture (the werewolf for instances) to strange and terrifying author creations. Stories go from the sardonically modern (with tales up to 1993) to the terrifyingly arcane with tales from the late 1800s, giving a good mix of styles and generations worth of fears, fantasies, and midnight terrors. Classic authors, including the beloved Edgar Alan Poe, Guy de Maupassant, and H.P. Lovecraft are included along with less known names, giving a flair for the classical and an appreciation of the new and experimental. There’s something here for each person; it would be impossible to walk away without at least a few dog eared pages and memorized lines. For a complete listing of this collection’s stories and authors (with lovely little hyperlinks) check out this page on the Speculative Fiction Database. Notice that publishing dates are listed alongside stories, giving a sense of the breadth of this particular collection. One of my favorite stories within this collection is “A Birthday Present for Tommy” (1945) written by Charles King. Told through the perspective of an enigmatic young girl with no memory of past and a fear of the future, this tale captures readers with its literary aspirations and the outright ability to, in just a few pages, trick us and horrify us, leading us to the very edge of insanity in a Lovecraftian manner. As can be expected of any horror short story involving a child protagonist, the premise is dark, disturbing, and elegantly entertaining. “Caterpillars” (1912) by E.F. Benson drew on my interminable fear of squiggling masses of insects (in this case spectral bugs) and dreary villas, capturing a moody, dark atmosphere that dwells on paranoia and fulfills the woebegone protagonists’ most lurid nightmares. Very in-line with Edgar Alan Poe tales and the entire Hitchcock idea that what is feared yet not fully seen is most horrible of all. Drawing on ancient legends of dreadful creatures that can turn viewers to stone, “The Basilisk” (1894) gives readers some old time horror as we journey through a realm with a beautiful woman, the man who is enamored of her, and the creature that she takes him to see. Ah, fine romance. For those of us with an inordinate love of prickly plants, “The Cactus” (1950) gives us a modern tale of travel and strange plants. With Invasion of the Body Snatchers style, “The Cactus” brings us into connection with a lonely woman who finds a mysterious plant to add to her collection – only her husband hates it. You’ll never look at your plants quite the same way, especially as this mysterious cactus blooms. Ever wonder why kitty suddenly becomes so attentive to movements that you cannot see? Ever wonder what it is your pet is staring at so intently? In Donald R. Burleson’s “Dark Brother” (1993), all our questions and fears are answered concerning the world around us in our quaint suburban happiness that only our pets, and a few things darker, can see. When the household’s feline becomes aware of another presence in the home and the family pet decides to abide with the entity, all those things that go bump in the night take on new and terrifying meaning. In “Exhibit A,” (1924) Anne Harris Hadley lightens the horror for a moment as we explore alien beings – a story terrifying in its scope yet beautiful in its conception and not fully negative. The story is somewhat longer than others in the collection with a psychedelic, science-fiction atmosphere that opens up wonder and possibility. “The Seeds from Outside” (1937) is perhaps the most heart-wrenching as a doomed love story across worlds plays out; readers will find it difficult to hold tears at bay when a dying plant woman lifts a tendril, attempting to bridge worlds that never should have met. A vindictive little jaunt, we also have some supernatural revenge stories my favorite among them being W.J. Wintle’s “The Specter Spiders” where an old miser meets an untimely end. 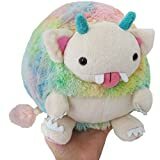 It appears that the murmurings against him, and a certain connection he has to blood sucking spiders, has caused some malicious interference from the beyond. Be careful what you say, it just might come true. While some of the tales within 100 Creepy Creature stories fail, the majority live on as favorites. Not a short story fan in general, this collection has lovingly changed my mind and proved a touchstone. As the years have passed, my once glossy hardback reveals the ravages of a much read, much loved anthology; Highly recommended.